Hi, everyone! I’m Midori Blackmore and I work at MOSHI MOSHI BOX, the Harajuku Tourist Information Center. 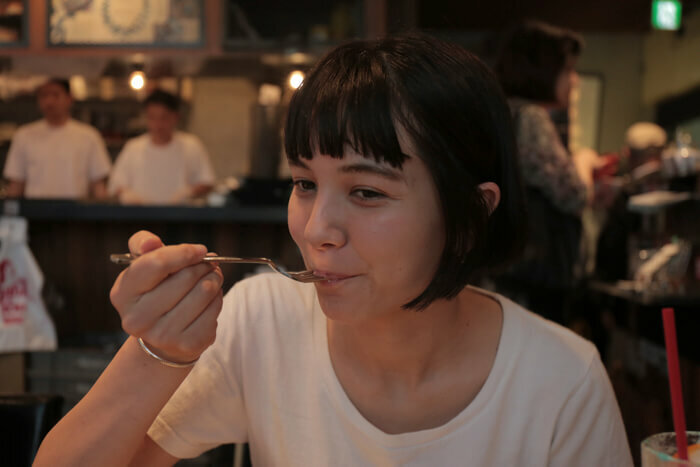 Today, I went to Cafe Hohokam with fellow MOSHI MOSHI BOX colleague Ellie, so I wanted to share my experience with you all. 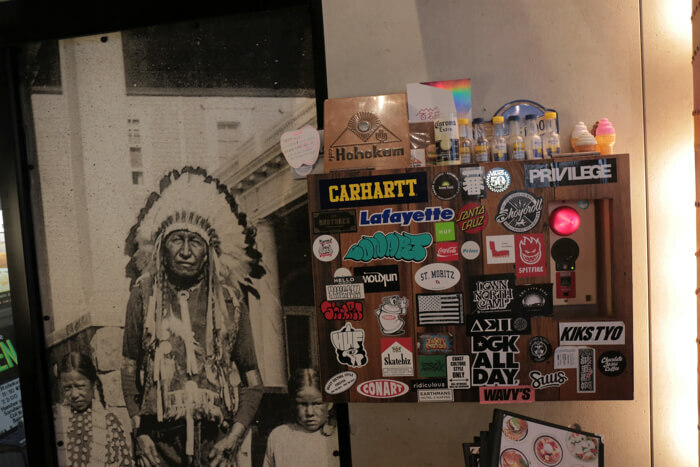 Hohokam is located behind MOSHI MOSHI BOX and can be found up the staircase past FABIUS Cafe. Head up these stairs to find the entrance. Hohokam is decorated to look like a motel you would see in Arizona. I’ve never been outside Japan before so I had to look up what exactly they’re like. Arizona is a state in the southwestern region of the US. It’s bordered by Mexico to the south, is very hot, and is home to the Grand Canyon. It also has the largest Native American population. *We have blurred the faces of the people inside to protect their identities. ‘I see,’ I said to myself and looked around. So that’s the atmosphere they’re going for. It’s very stylish but also feels incomparable to anything else. We both ordered an orange cream soda with a Hohokam burger and French toast that comes topped with Nutella, bananas and whipped cream. How amazing does this look? 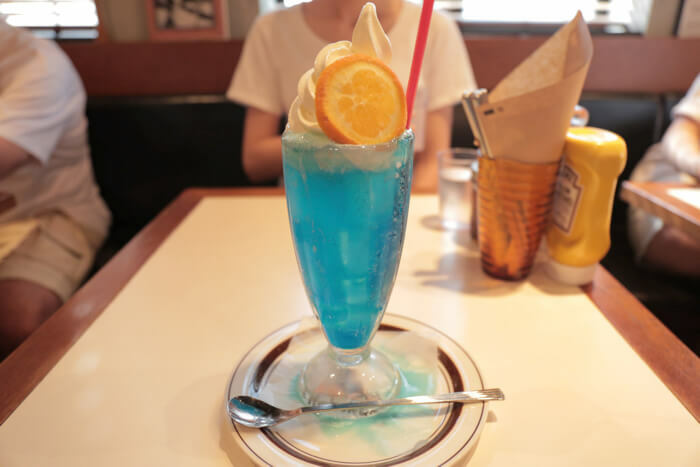 It looks like the cream soda you only see in manga. I was really surprised. It’s tall and the colour is gorgeous. Really just the best. This must be the proper way to make it in the cream soda industry. When you drink your cream soda, don’t you think to yourself, ‘Summer has arrived,’ too? It’s strange when you first take a sip because although it’s blue it has an orange flavour. The soft serve cream on top is also sweet and really delicious! 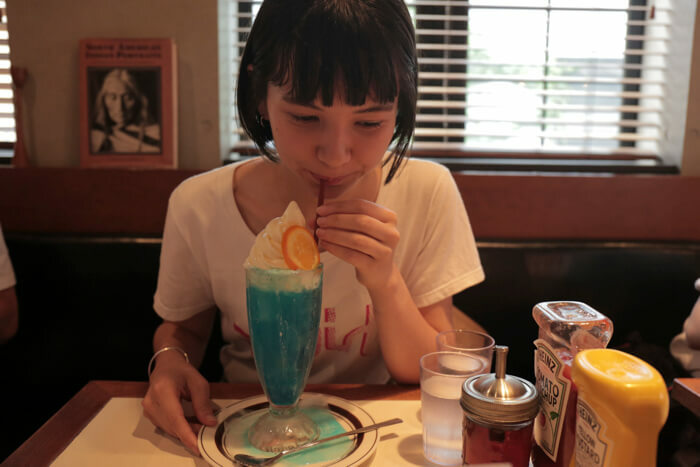 There’s four cream soda flavours to choose from: melon, raspberry, lemon and orange, and they’re all supposed to be colourful and taste good. It might be a fun idea to order different coloured drinks with your friends. 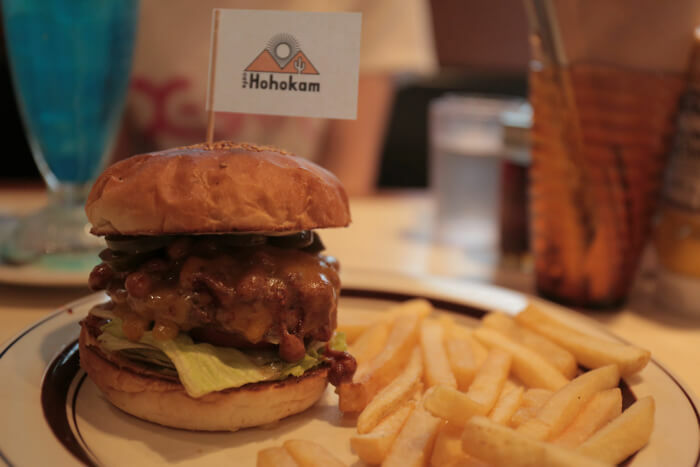 Next up is the Hohokam burger! 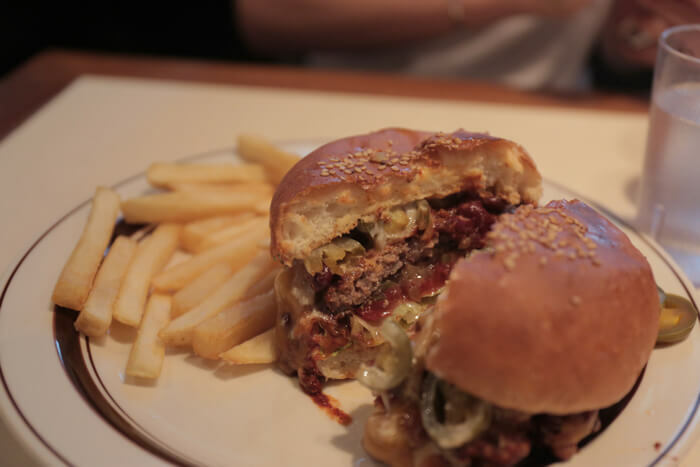 The menu said it has chili beans, cheese and a jalapeno patty. The flag on top is cute, isn’t it? You can wrap the burger with the napkins provided on the table before biting into it, but we both shared it. This is how it looks cut in half. The red part is the chili beans. It’s spicy when you take a bite, but it’s not overly spicy at all! For me I thought it was a refreshing kind of spiciness like that of Mexican cuisine. I’m no good with spice and even I could eat it. The meat inside was made very well. It was just the kind of hamburger you’d expect at a hamburger shop. There’s a bunch of other burgers to choose from too, like the mozzarella burger, barbeque burger, cheeseburger and more. Last up is the French toast with Nutella & Banana & Whip cream! Something looking like this has got to be delicious. The burgers at Hohokam are of course delicious, but I personally want to give the nod to their desserts. They’re seriously something else! 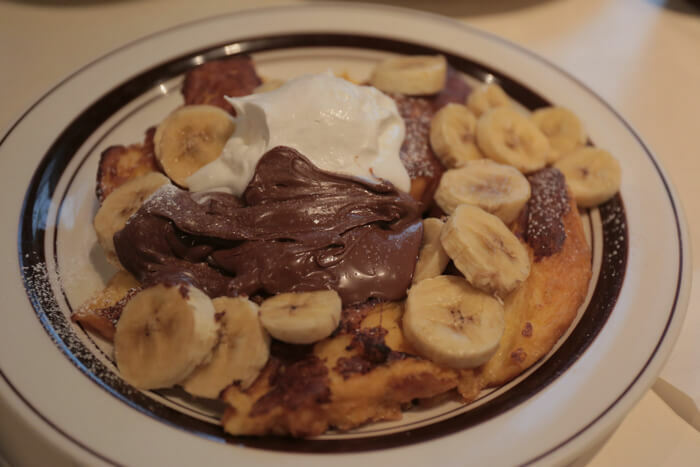 The fluffy French toast is topped with sweet Nutella and whipped cream, but it’s not heavy at all. We were already quite full but we were able to lap it up easily. 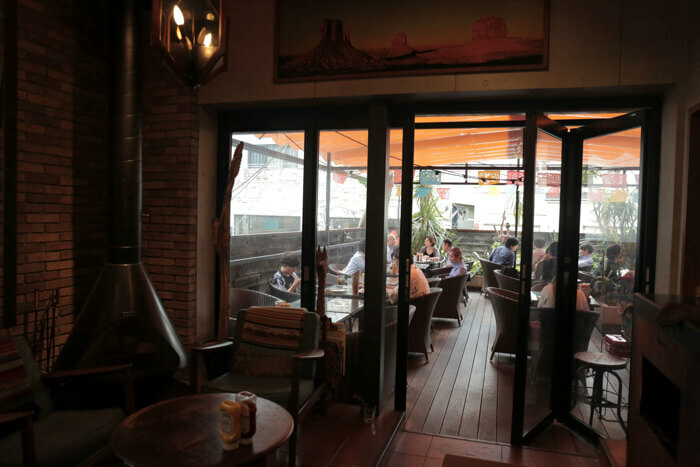 They also have a terrace smoking area. The atmosphere there was fairly nice too! Dining outside can make eating your food taste good too, can’t it? Another great thing is that everything at Hohokam can be ordered for takeout! 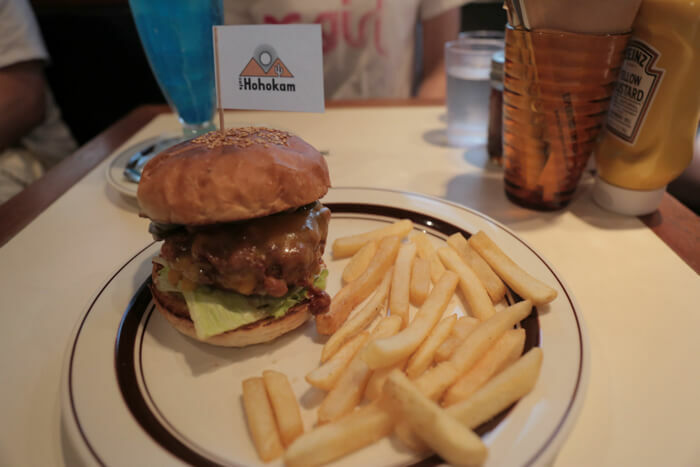 We recommend getting a delicious burger and having a picnic in Yoyogi Park! 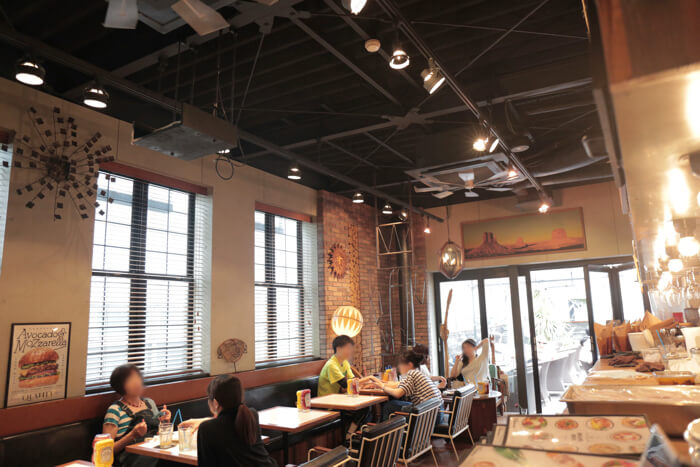 So, do you like the sound of Cafe Hohokam? It’s great for lunch or dinner, and we also recommend using it as a café to stop by when you’re out shopping. 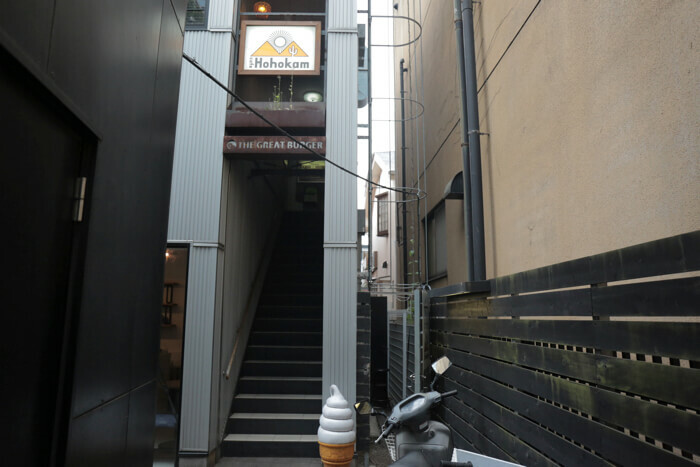 If you’re in Harajuku and have an empty stomach, or you’re in need of a dessert, then please try Cafe Hohokam for yourself. 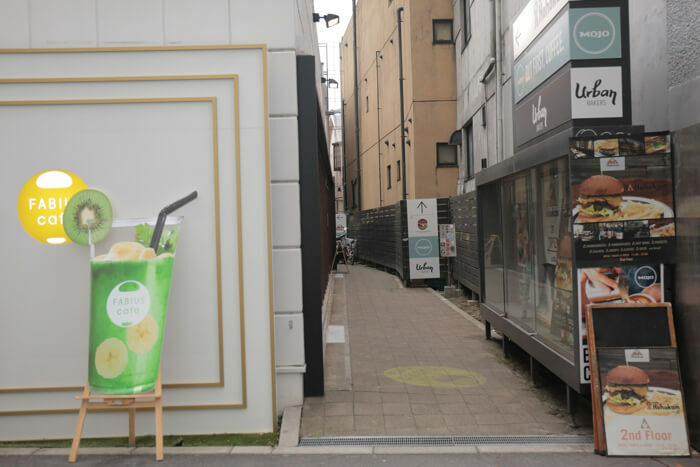 Harajuku’s artistic okonomiyaki restaurant: Reporting from Sakura Tei!